It was Matthew who delighted to quote fulfilled Messianic prophecies in His gospel. This former tax-collector thrilled to link the Lord Jesus Christ with prophecies of old. This disciple of the Lord Jesus trawled the Old writings and linked them with the New. This apostle of Christ, uncovered prophetic Scripture and secured them in his writings. He rooted Christ’s genealogy to the patriarchs of old – to Abraham, Isaac and Jacob. He linked Christ’s Jewish lineage thru the esteemed kingly line of the great king David. Much in his gospel demonstrated the legitimate Messiahship of Jesus – to Israel. Matthew took the prophecies of Old and certified their fulfilment in the New. He was a writer who saw what was hidden in the Old – and revealed it in his Gospel. As the old maxim goes: The new is in the old concealed. The old is in the new revealed. Matthew historical record showed the genuine genealogical supremacy of Jesus Christ. He proved Christ’s legitimate claim to be Israel’s king – and proclaimed Him as God. 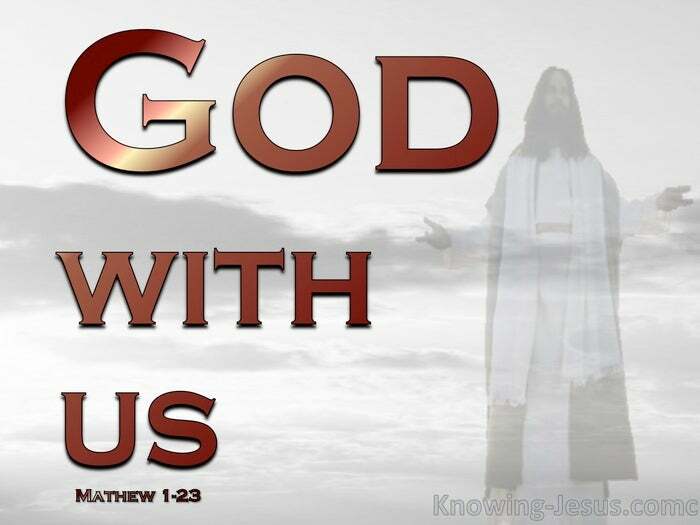 He also gave many indications that this man Jesus was God Incarnate – God with us.. 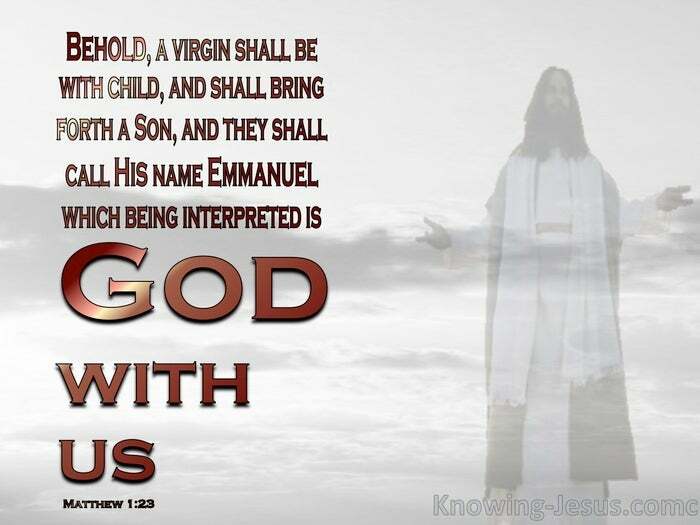 He wrote of Isaiah who cried out to Israel – the Lord Himself will give you a sign; Behold, a virgin shall conceive, and bear a son, and shall call His name Immanuel – Immanuel, which being interpreted is, God with us – God manifest in the flesh. John called Him the Word made flesh, while Mark writes of the beginnings of the good news about Jesus the Messiah, the Son of God – and Matthew calls Him Emmanuel. Christ was not merely a man, chosen from the human race to play the part of Messiah. Nor was He a created Son of God, like the host of angelic beings or the race of man. Christ was God – the one and only Creator God who was in the beginning with God. All things were made by Him and all things are held together by Him – for He is God. He was the Word of God Who has an eternal existence and spoke the worlds into being, but that same eternally existent God became flesh, and was born as a helpless baby. Scripture is replete with passages in the Old Testament that are all fulfilled in the New. The Bible is full of the attributes of God that are attributed to the Lord Jesus Christ too. God Who never changes in Malachi is Jesus! – the same yesterday today and forever. In Zechariah God spoke of Himself – they will look on Me, Whom they have pierced, and in Revelation Christ is recognised as being the fulfilment of this prophecy:- He is coming with the clouds, and every eye will see Him, including those who pierced Him. Jesus is Omnipotent – for all power has been given unto Him. Jesus is Omniscient – for He knew all men and what they thought. Jesus is Omnipresent – for He promised to be with us to the end of the age. Jesus is Creator – He made all things; and nothing was made without Him. Jesus is Saviour – I, even I, am the LORD; and beside me there is no Saviour. Jesus is the first and last; the beginning and the end – the Alpha and Omega. The Lord..forgiveth all thine iniquities – and Jesus also forgives sins. The Lord our God is One – yet Jesus and the Father are One. God is glorified – but now all men should glorify and honour the Son. God is from everlasting – yet Christ’s going forth is also from everlasting. God is the holy One of Israel – and Jesus is the holy One Who did not see corruption.